English Solutions Vancouver, preferred English Tutors Vancouver for Mandarin Speakers. We have the most innovative and success-driven English tutoring service in Vancouver, BC. 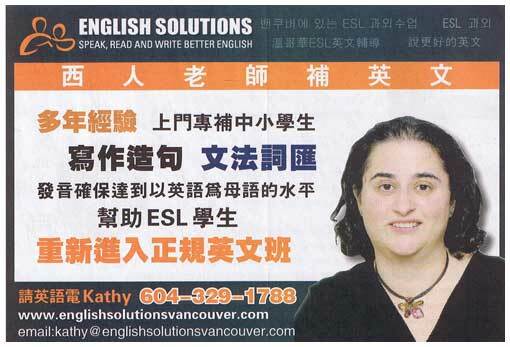 A few years ago, we expanded our tutoring by advertising as English Tutors Vancouver for Mandarin Speakers. We specialize in helping children, teens and adults become better at writing, reading and speaking English. As the image on this page shows, we are especially experienced and interested in working with native Mandarin speakers. English Solutions Vancouver specializes in working with children and young adults. Focus is on studying ESL or transitional English. Courses include daytime and after-school classes, plus tutoring services, suitable for junior high school and high school students. Tutoring covers English, English as a second language (ESL), language arts and sociology courses. Improve English reading, writing, spelling, pronunciation, fluency, vocabulary accumulation, thesis writing and proper grammar. In addition, we help students prepare for all kinds of examinations, including academic TOEFL, oral, IELTS, Celpip, or LPI exam. We have extensive experience in motivating and engaging young children with learning in both group and private settings. English Solutions Vancouver also offers on-site corporate English tutors Vancouver for executives and company employees. Our classes are for those who require additional English Language training and accent correction. Individual and group lessons are specifically developed to suit corporate clients. Lessons and tutoring are suitable for executives, corporate presidents, and associates of foreign companies. We focus on those who would like to improve their English communication skills (listening and speaking). Our goal is to build confidence so employees can speak and understand the new language. We enhance the daily use of the language in the work environment. You’ll find our English Tutors Vancouver for Mandarin Speakers are specialists in working with adults, especially those who are native Mandarin speakers.